Visions Of Plenty was produced by Johnny Pierce and recorded at Cedarhouse Studio in Arrington, Tennessee. Musicians include Emmylou Harris, Bo Ramsey, Kevin Gordon, George Marinelli, and Spooner Oldham. The album was nominated for “Folk Album Of The Year” at the Nashville Music Awards in 1998. 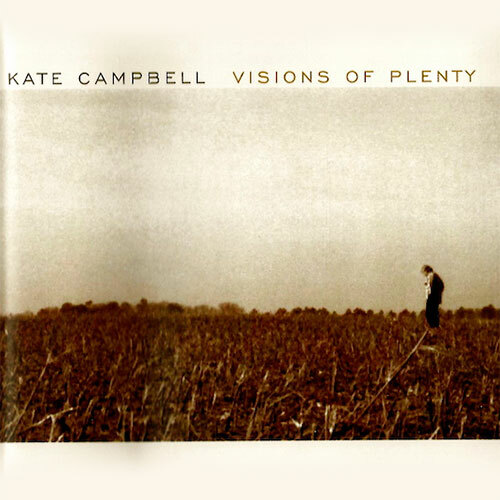 In the remarkably short space of two albums, singer/songwriter Kate Campbell has come from total obscurity to gain a position of praise and prominence usually achieved only after attaining a much lengthier resume. It’s no wonder; as Visions Of Plenty, her remarkable third outing attests, Campbell is a wonderfully sensitive and expressive singer and songwriter, one with an eye for detail and an ear for a vibrant melody. Musically, Campbell wins comparison to the likes of Emmylou Harris, Mary Chapin Carpenter and Nanci Griffith. However, it’s her literary reference points that have made the critics sit up and take notice. Born and raised in Mississippi and Tennessee, her songs capture the heart of the Southland in a way that some have likened to William Faulkner and Tennessee Williams. The sweetly engaging title track finds her singing of faith and dreams even in the midst of despair and desperation. The images of urban decay that’s captured in the minimalist lyrics of “Deep Tang” is awash in futility and resignation. “Bus 109” and “Crazy In Alabama” offer vivid views of the struggle against segregation from a southerner’s point of view, capturing the chaos and confusion that run through childhood memories. “And the train of change, Was coming fast to my hometown, We had the choice to climb on board, Or get run down.” Fortunately, Campbell also finds reason to rejoice, whether It’s the celebration of spirit in “Funeral Food,” a playful poke at religious quackery in “Jesus and Tomatoes,” a would-be-bowling pro’s just-shy-of-perfect score in the perky “Bowl-A-Rama,” or the embracing envelope of love and support that shines through the soothing “Perfect World.” In addition, the album demonstrates real musical muscle, thanks in part to a stellar supporting cast that includes Emmylou Harris, Spooner Oldham and especially producer/guitarist Johnny Pierce whose engaging arrangements complement the songs with shimmering textures throughout. From the delicate blend of recorder and guitar on the lovely “This Side Of Heaven” to the bluesy gospel stance of “Sing Me Out” to the funky saxophones that accompany Kate’s Bonnie Raitt–like take on “Suit Yourself,” Campbell and company effectively vary moods and melodies throughout. Is Visions Of Plenty the best album of Campbell’s career? It’s hard to say; her first two offerings, Songs From The Levee and Moonpie Dreams are so outstanding, they defy comparison. But as far as Campbell’s competition is concerned, those who aspire to claiming 1998’s folk or country album of the year are gonna be hard pressed to come up with a musical masterpiece that can top this. Any takers?